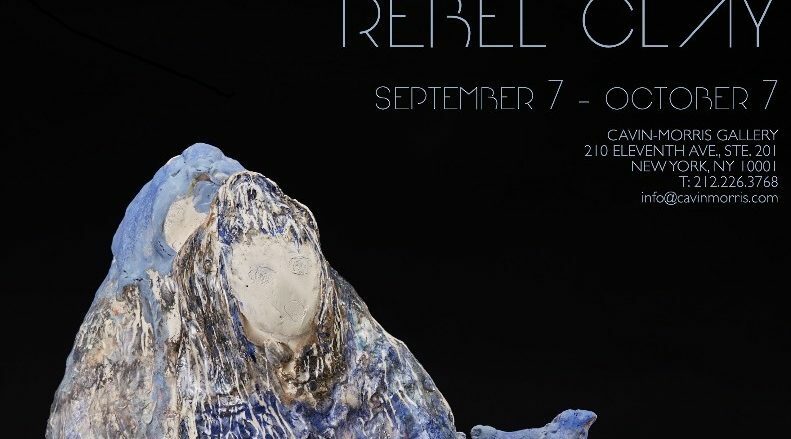 Cavin-Morris Gallery is pleased to present an exhibition of non-mainstream ceramics titled REBEL CLAY. This exhibition will be the first of its kind in the country. 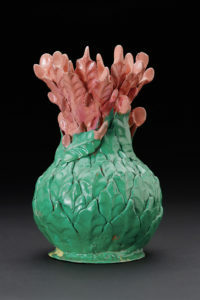 Jim McDowell has made utilitarian ceramics in addition to pursuing a not so covert ceramic form that explores his ancestral memories and legacy. 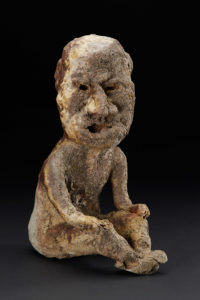 His spirit jugs refer to altars and the Kongo cemetery complex before becoming sacred memorial objects made by slaves and freed men in the US and Caribbean. He is the only African-American spirit jug maker in the United States. Sylvia Katuszewski’s pieces are raw and expressionistic yet they have an interior tenderness with dream-like subjects. She uses her glazes and pigment like paint. Her early association with the Dadists suggests an inference of symbolist poetry in the dark perfume of her subjects and colors. Nek Chand, who sculpted in cement that he molded like clay, needs little introduction. He is known for his huge environment in Chandigarh, India with its thousands of expressive figures and exquisite architecture. Bessie Harvey was an artist who used her working knowledge of Conjure in her more well known wooden and root sculptures of spirits. We are fortunate to have a pair of small painted ceramic figures by her from the 1980’s that will expand our understanding of her artistic capacities. Another artist known for his creation of a deeply personal world is the American Art Brut master, Eugene Von Bruenchenhein. There is a delicious delicacy to his paganesque vases fashioned from ceramic leaves. He dug his own clay and fired his pieces in the wood-burning stove that heated his small home. Along with the vases, we will exhibit one of his crowns, some of which were worn by his wife, Marie, in the evocative photo portraits he made of her. 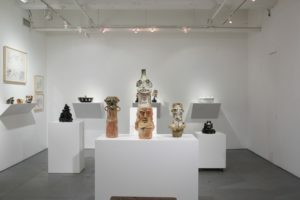 The sculptures of Kevin Sampson, familiar to us from what we can see in the collections of the Newark Museum, Intuit, in Chicago, and the American Folk Art Museum, would have worked well in this exhibition. Instead we will exhibit some of the results of his recent residency at the John Michael Kohler Arts and Industry program. Sampson experimented with his themes of cultural resistance and ancestral remembrance in stark black and white porcelain. The curators first encountered the work of four Japanese Art Brut artists when we visited the Yanomami Art Center near Shigaraki Prefecture in Japan. We were intrigued by the balance of whimsy and a feral pop demonic aesthetic of Kazumi Kamae, Yukio Miyashita and Masami Yamagiwa. Burgess Dulaney found a way to fill time in a hardscrabble life farming subsistence crops, outside the realm of literacy and schooling. His work evokes images of proto-humans, and fantasy animals. They are timeless. They have become rare and we were fortunate to find three for this exhibition. David Parsons is a new artist to be shown at Cavin-Morris Gallery. His work pulls essential souls from his animal subjects in a gestural, visceral way. The marks of his hands are everywhere in the work, even when covered by his forceful, colorful glazes. We have also included some of his abstract drawings. We are working with Creative Growth, from Oakland, CA, in the presentation of this artist. I’m interested the relationship between ritual and power creating religious objects from these ideas. My art practice attempts to go beyond or behind customary established dogma, to experience the intersection between science, religion and belief. Chrissy Callas creates small, intimate pieces that are sensitive and emotional, their rough or glazed surfaces reflecting inner conflicts and resolution yet maintain a sense of mystery or isolation. She comments I use clay to exploit Man’s conflicts, frailty, muscle, and wit; Art imitating real life from chunks of clay. The work speaks for itself. You either get it, or you don’t. Also included are some drawings by Melvin Edward Nelson. He used pigmented earth that he referred to as stardust, gathered from under the runners of UFOs that landed on his property in Oregon. He wetted a sheet of paper on a board, added the earth pigments and allowed the electromagnetic energies of the Earth to create what he said were depictions of the birth of planets. He called these drawings ‘Photo Genetics’. Ricardo Estella and Peter Cordova are both from the Phillipines. Both make their work at Creativity Explored in San Francisco. There is a strong roots feeling to their work as they give us very different imagery, from the mundane to the supernatural richness of their American and Filipino roots. Finally we have included several old masks from Nepal modeled out of cow dung and used like clay. They are then dried and covered with a smoke patina. There is very little research done on these most basic of masks and we are glad to have four for this exhibition.